I returned the next day, and tried something else. 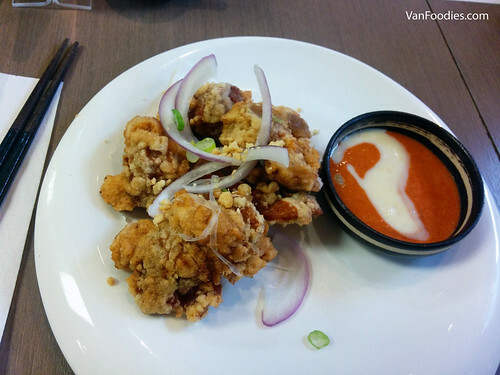 The Chicken Karaage (appetizer version) was a decent portion. The chicken pieces were cooked just right and they were piping hot as I bit into them, but the breading was a bit thick for my liking. The accompanying red and white sauce was called the “All-in-One” sauce. It tasted like a paprika aioli, which had a very subtle hint of spice. I think the chicken karaage at Hi Genki and Mogu were better. I also ordered a Spicy Tuna Roll. This is one of my go-to rolls. 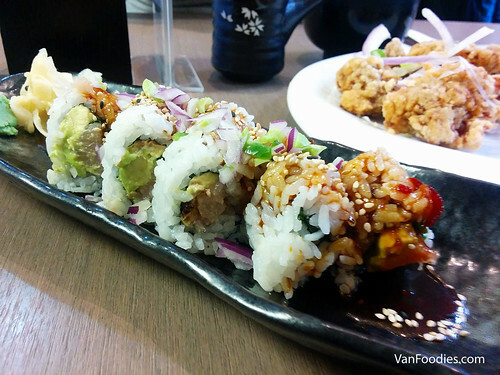 I used to have a favourite place for spicy tuna roll; it’s very unique because they added crunchy tempura bits in the roll. That sushi place is closed now. Anyway…this was a decent roll. I wish the spicy sauce was actually mixed in with the tuna, but the sauce was actually on the plate; so I had to make sure to swirl around the plate to get the sauce. Otherwise, the roll itself was pretty light in flavours. Overall the texture of the roll was on the mushy side, so I did appreciate the addition of edamame beans for some crunch. At Kita no Donburi, you have to place your order at the cash register first. You’ll be given a number on your receipt and they’ll call out the number when food is ready. If you’re dining in, then you can find a seat and wait for your number to be called and your server will bring over the food. I thought they were able to pump out food really quickly. I was able to be in and out within 40 minutes. 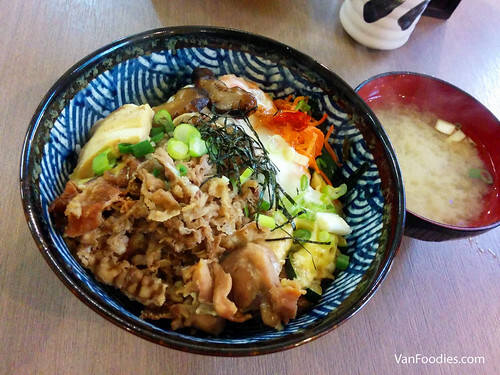 Kita no Donburi is a popular spot for nearby students and working professionals. The food was quite good and the menu is priced relatively reasonable for the downtown area (most items are under $10). And the service was speedy. I would come back for lunch again.